A Lowe’s home improvement center could open its doors in Yorktown in the coming year. Construction crews are continuing to complete site work on the property at 3200 Crompond Road. Once completed, the 25-acre site in Yorktown Heights will be home to a 124,000-square-foot Lowe’s and three other business, ranging from up to 4,000 square feet to 15,000 square feet. “We’ve done a lot of underground work to make way for the foundations that have to go in,” said Wilbur F. Breslin, CEO of the shopping center’s developer, Breslin Realty Development Corp.
Breslin added that Lowe’s “should be open by the early part of next year” and said the shopping center’s other tenants have yet to be selected. 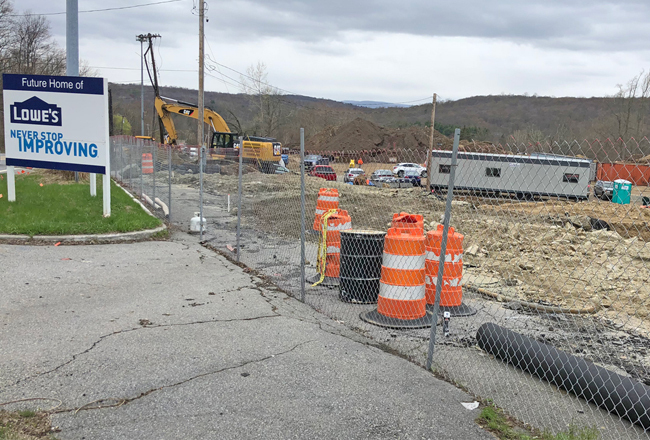 The Garden City-based developer broke ground on the roughly $70 million project, which is just off the intersection of the Taconic State Parkway and Route 202, in October of last year. The long-vacant site was formerly occupied by the Yorktown Country Inn, which closed more than 20 years ago. The property was last used as a county-run homeless shelter. To make way for the new development, the company demolished the site’s existing dilapidated and graffiti-covered structures. An October groundbreaking for the roughly $70 million project marked a milestone in what has been a long road for Breslin’s company, which has been in talks to develop the property since 2009. The development replaces a previously approved 151,092-square-foot Costco and a members-only gas fueling station on the site. The Yorktown Planning Board approved the $60 million project in November 2015. Costco’s project hit a snag when its on-site gas station was strongly opposed by independent gas station owners in Yorktown. Yorktown Smart Growth, a residents development watchdog group, Yorktown Gas Mart Inc. and Quick Stop Central Ave. Inc. filed a lawsuit against town officials and Breslin Realty Development claiming the big-box store would hurt area gas station owners and sought to have the town’s approval of the project overturned. After years of delays and roadblocks, Costco ultimately pulled out of the project in 2016. While the Costco project spent years in the planning stages, the Lowe’s development was approved just three months after it was proposed to the planning board. The Yorktown Lowe’s would mark the Mooresville, North Carolina, chain’s second facility in Westchester County. Last summer, a 70,000-square-foot Lowe’s opened at Ridge Hill in Yonkers. “We decided to add a new store in Yorktown because we believe it’s a great location to provide residential and professional customers everything they need to improve or maintain their homes,” said Ashley N. Glasser, manager of corporate communications for Lowe’s Cos.